Do you all remember Heather? She's the other gal from my church who reads and is practically my TWIN (except she isn't) when it comes to the way we think, read and don't camp outdoors. (I bet she doesn't like slugs. I haven't asked her but I just bet she doesn't!) At any rate, I had a review copy of Turn Right at Machu Picchu sitting on my desk that she expressed an interest in reading it. So, I handed it over and figured I'd wait to read it and see if she liked it and she did! Below are Heather's thoughts on said book. I’ve been on an adventure book kick recently. I haven’t really done much soul searching to find out why this is, but my guess is that it’s something I tend to be a little schizophrenic about. On the one hand I hold the type of people who go backpacking in the wilderness for a month in great awe and there is even a little piece of me that wishes to be the woman who would do it. On the other hand there is the real me who hates being dirty, is terrified of insects and heights and being cold, and has never taken the miracle of indoor plumbing for granted. I’m left to satisfy my inner adventurer by vicarious reading. I’ve been frantically checking out books about far off places and long road trips and hikes across America. 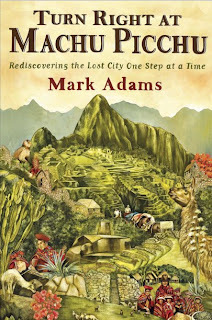 So Mark Adams’s Turn Right at Machu Pichu fitted in quite nicely with my recent craze. Mark Adams is pursuing an interest in Hiram Bingham, Yale professor who allegedly discovered Machu Pichu in 1911 and may be the inspiration for the adventurer Indiana Jones. Adams, like me oddly enough, is someone who read and wrote about adventures all the time. Adams, unlike me, got paid to do this. He wrote for magazines like Outside and The National Geographic, and had been itching for an adventure of his own. So, when the 100th anniversary of Bingham’s discovery drew near and when Adams is alerted to the existence of a map that may prove Bingham’s claim to discovery to be false, he decides to hire a guide and follow the same route Bingham took in 1911. Mark Adams’s guide happens to be John Leivers, an Australian in his late 50s introduced to the reader early on as: “Extremely fit; dressed as if ready to clamber up the Matterhorn though it was a cloudless, seventy degree day; and about as unattached as a man could be in the twenty-first century. He had no wife, no children, no permanent mailing address, just a cell phone and a Gmail account.” The interaction of this colorful character and the author who admits, “The last time I’d slept in a tent was in 1978, when my father brought an imitation teepee home from Sears and set it up in our backyard,” would make for a great read by itself. Both of these men come from such disparate backgrounds and even the differences between American English and Australian English is hard for them to overcome, but they do overcome it. And it is just funny. I found myself laughing out loud a lot. The obvious reason to read this book, however, is if you find travel to exotic locations at all interesting. I don’t know anyone who doesn’t. Whether you would actually do such a thing doesn’t really matter. The idea at least holds an appeal. Mark Adams’s career as a writer for adventure magazines makes him the perfect person to write this story. His writing is particularly descriptive and drove me onto Google a couple of times hoping to get a taste of the experience. The interactions with the local people were very entertaining. The best story was of Adams’s interaction with two children who didn’t know where New York was, didn’t know where America was, but were curious if it was true that Michael Jackson had died. I can’t do justice to how funny that particular anecdote was, so I guess you’ll just have to read it yourself. 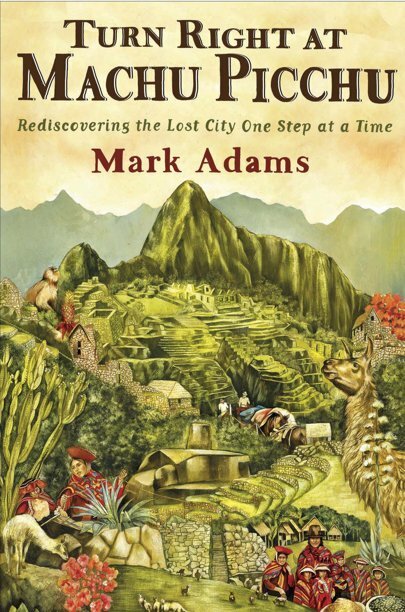 Something else I appreciate about the book is how Adams weaves the story of Hiram Bingham’s adventure with his own and even goes further back in time and mixes in some of Peru’s fascinating history. This was particularly helpful to me as I had only heard the name of Hiram Bingham and could probably not place him in his historical context. It would be a stretch to say I even knew he had anything to do with Machu Pichu. Also, I had no idea how interesting Peruvian history was! I plan on doing a little reading up on it now. For more conservative readers, some of John Leivers’s language is pretty earthy, and naturally if you are going for this long of a hike there will be some talk of bodily functions. I found myself quite pleasantly surprised at how circumspect Mark Adams was. I know I shouldn’t be because this is a non-fiction book so how gross can one get, right? Well, I won’t get on a rant about “books these days,” but sometimes they do, and this one didn’t. Also, the last bit of the book dwells quite a bit on Incan theology….philosophy?...religion? Apparently right now Peru is a Catholic country officially. However, sacrifices are still made to the mountains and a sort of syncretism has cropped up between Peru’s Catholicism and the ancient Incan religion. And naturally, I disagreed with this syncretism, but the book isn’t being proscriptive here, just descriptive. Anyway, I’m glad I read it, and found Mark Adams’s writing to be humorous and informative. I plan on exploring some more of his works along with some books on Peruvian history. I recommend it wholeheartedly. Now I simply have to read this book instead of just "have" to. What about you? Thanks, Heather, for sharing your thoughts on it! Thanks to Penguin Group for sending a copy of this book my/our way! Yes. (To the question "What about you?") This sounds like a fun book. And really, Carrie, does anyone LIKE slugs? ha! Sounds like a good book. I've seen it at my library but haven't picked it up yet. Hurray for a good recommendation! Annette - YES! I know someone personally who likes slugs. It's a terrible thing. Oh Carrie! And now I have to separate our twin-ness momentarily and say I kind of do like slugs. And I like camping. Provided there are nearby clean bathrooms with both showers AND flushing toilets. And I can bring an air mattress and various other amenities. I especially love camping when it's done in a hotel, preferably with a view of the ocean....wait...is that not camping? Well, clearly we are not twins if you like slugs. (Violent, disgusting creatures.) I can usually work outside in the yard until I see a slug. Then I have to rush inside (screaming usually) to take a hot shower and clean myself thoroughly. Just LOOKING at one makes me want to do this. If I happened to accidentally TOUCH one then I have to get out the alcohol and pour it all over my poor infected area. Just disgusting. They are not to be liked! NOT. AT. ALL! I read this last summer, having been to Machu Picchu the year before. I rode in a bus, mostly, and no mules were involved. Ok, this book goes on my "to borrow from the library" list. It sounds right up my alley. Heather, I love your use of footnotes, even if I will probably never be that careful with my quotes. Re: slugs. Slugs on land: Get your slimy teeth (?) off my plants!!!! Slugs in the ocean: amazingly beautiful creatures, even the basketball sized sea hares. Sounds interesting. You and Heather might also like The Lost City of Z which was a really fascinating read. @Carrie: STILL laughing over your slug comments!